Stefani Stein is a Los Angeles based interior designer. Her eponymously named firm was established in late 2014, offering full service interior architecture, design, renovations & custom furnishings. The firm's approach to design embraces the idea that each client and space are unique. Regardless of the project size or scale, Stein believes that inspiring spaces evolve from the collaboration achieved by listening to both the client and the architecture. With an emphasis on supporting specialized craftspeople and workrooms, the firm's fabricators are an integral part of the design execution. All of this steers the narrative flawlessly from concept to completion. This philosophy has led her to consistently create timeless designs in her signature relaxed & refined aesthetic. Clean, modern touches intertwine with both classical and unexpected elements throughout her projects in the bespoke commercial and residential spaces. 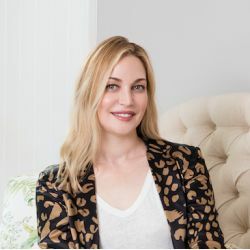 Stein's expertise and designs have appeared in Architectural Digest, Domino, Conde Nast House & Garden, Elle Decor, HGTV, House Beautiful, House & Home, Lonny, MyDomaine, & more.